LEIOA 07-03-19. The Rotary Club of Bilbao has selected this evening for its charity campaign the txakoli Erdikoetxe, from the winery of the same name, which is based in Lezama. The selection has been made after tasting 12 brands of Bizkaiko Txakolina from 10 wineries of the DO by six members of the Association of Sommeliers from Bizkaia, and an expert from the Rotary Club. 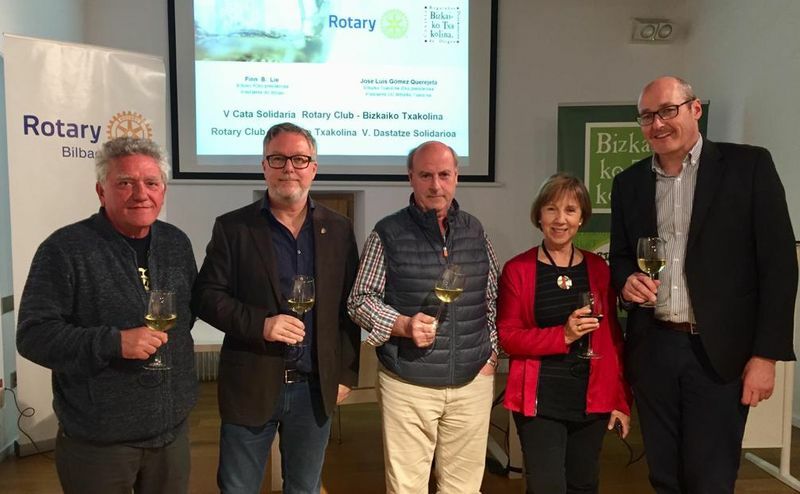 The Rotary Club of Bilbao will market the selected txakoli among the members of all the Rotary Clubs, and will allocate the benefit to a vaccination campaign against polio. After the tasting, a social event was held at the Mendibile headquarters with the assistance of Rotary Club members, winemakers, producers and guests.